What Goes Into an Outdoor Kitchen? When it comes to cooking, anything you can do indoors can be done outdoors—sometimes better. There's something about the aromas and flavors of grilled cuisine that has made barbecuing a significant part of home life and entertaining since the 1950s. Barbecuing has come a long way since the early charcoal grills and hibachis used during the postwar years of patio culture. Now outdoor cooking centers feature higher-tech appliances and more sophisticated components that help to create an easy and potentially luxurious outdoor lifestyle. Before launching into a project, think about the following design tips and considerations that will help you cook up the ideal outdoor kitchen suited for you and your needs. Determining the best type of outdoor cooking center will depend on your budget, lifestyle, and space, among other factors. At its most basic, it could include a grill and maybe a store-bought outdoor bar that serves as a counter. As for extravagant: the sky's the limit! Like anything, you can get as elaborate and spend as much money as you desire. Decide if you want a fully functional kitchen or something more simple. From there, you can determine what is essential and what's an amenity, and if your budget and taste have room for the extras. Keep in mind that it's outdoors. Nature shouldn't be complicated. If you live on a sprawling lot with lots of acreage, then your challenge might be making sure you don't have to walk too far from the house to the outdoor kitchen to fire up the grill. Most properties are smaller, presenting fewer choices for the location of a grill and outdoor kitchen area. If you rent or plan to move in the next few years, it might be a good idea to equip your outdoor kitchen with appliances and features that can move with you. If you don't see yourself going anywhere or simply love the DIY thing, then an outdoor kitchen might be a satisfying project for you to design and build. Determine a convenient and safe location, use materials that coordinate with your home's exterior and are locally available, and find plans and blueprints online or in books. Make a budget and work within it. Things can easily get out of hand and end up costing more than anticipated, like materials, appliances, and labor. Additional costs include enlisting the services of a designer, obtaining permits, tools, and professional help for things like electrical and plumbing. Determine your favorite style and method of outdoor cooking: do you love grilled fish or a hamburger cooked over a charcoal barbecue? What about pizza cooked in an outdoor brick oven? Tandoor or a smoker? An outdoor can include anything from a gas, propane, electric, or charcoal grill to various ovens and stoves. Do you prefer to prepare food outside—like fish—or are you okay with prepping indoors and bringing it outside to cook? Do you need a sink outside? While designing, think about the maximum number of people you'll be cooking for. 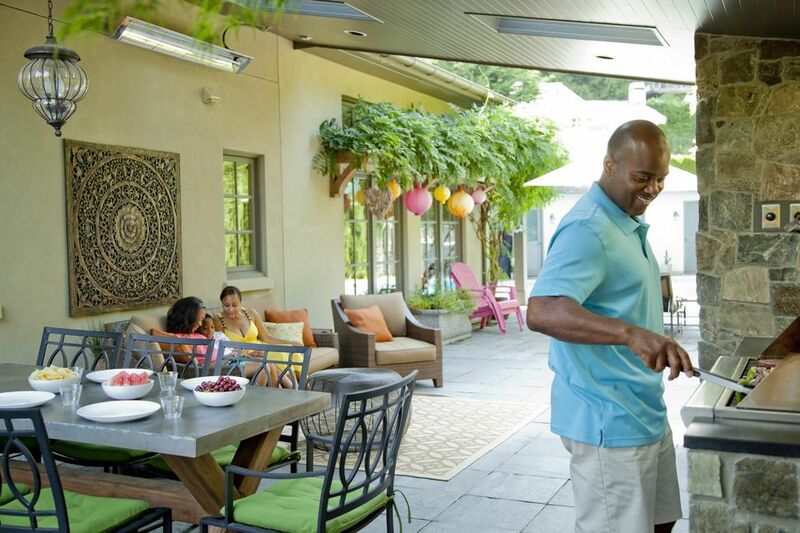 Plan several of your favorite outdoor meals and make sure that the outdoor kitchen you have in mind can handle the prep and actual cooking, while also accommodating guests. From there, make adjustments. If you live in the western United States, Florida, or a region with a mild climate, you'lll be spending more time in that outdoor kitchen. Maybe even more than the indoor counterpart. If this is the case and you find yourself pretty much living outdoors, a larger outdoor kitchen might be justified. For other areas that experience more extremes in weather, location within your yard is important. Pay attention to microclimates. You want to avoid spots that are windy, too hot, too shady, or cold. If you live in a region that gets lots of rain, consider locating your grill or kitchen under a cover or partial patio roof. 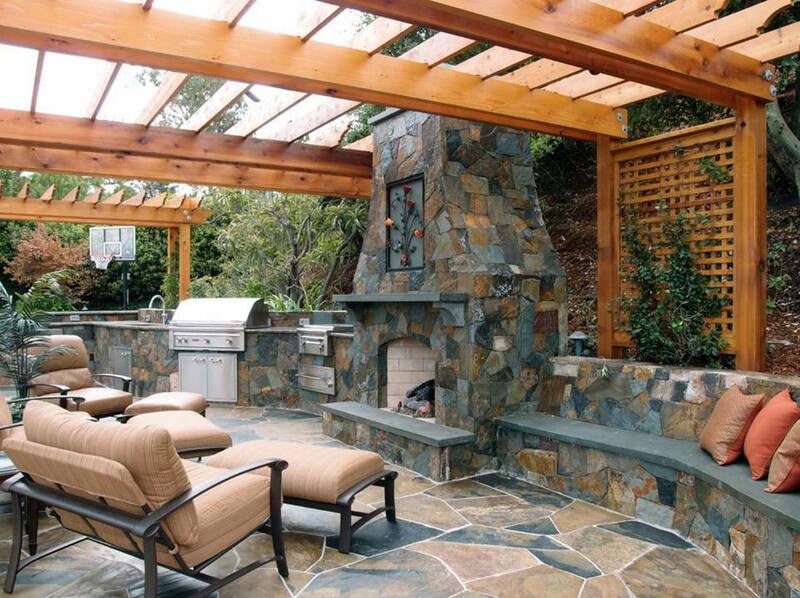 An outdoor kitchen is exposed to the elements. Even if you don't use it often, appliances and surfaces will need to be covered and maintained because they are outdoors. Think about the time and effort it will require to keep up a kitchen you build or install. Will you have help or are you going to be the lone chef and cleaner? Make it easier on yourself: sometimes simpler is better. If the kitchen will be permanent, look to materials used on the exterior of your home, like brick, concrete, or stucco, along with details made of metal or tile. These look attractive and create continuity when used on an outdoor structure, like a kitchen. Besides looks, budget, availability, and labor, the size and scope of your outdoor kitchen will influence choice of materials. How many household members will be cooking outdoors and what type of cooking do they prefer? How often will you and others be using the grill and kitchen? Be realistic. You can always start modestly and add appliances and extras as you get more into it.